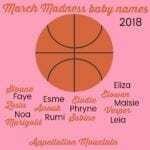 March Madness baby names 2018 continues with the girls’ quarter finals! The opening round brought a few surprises. And, of course, a couple of perpetual disappointments. Why is Elodie always a bridesmaid, but never a bride? 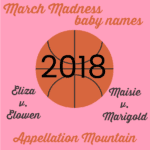 The name makes it to March Madness nearly every year, but has yet to win. I think I might be able to guess the winner from this week’s result – but, to be honest, every year surprises me. Time to review the results from the opening round! Anouk, an intriguing form of Anne, swept past Beyonce baby name Rumi, 52% to 48%. Sabine handily defeated Phryne, 85% to 15%. Botanical Marigold scored 52% of the vote, leaving Elodie with just 48% – and perpetual runner-up status. In the battle of the night sky and the silver screen, Leia garnered 58% to Vesper’s 42%. Eliza won the zippy-z showdown with 69% of the tally, against Zosia’s 31%. Literary Esme’s 59% put this rising favorite into the next round, instead of tailored Sloane, with just 41%. Sweetly, vintage Maisie earned a solid 59% to leave behind the similar Faye, at a mere 41%. 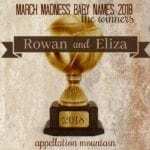 In the second-biggest triumph of the week, Elowen bested Noa, 72% to 28%. 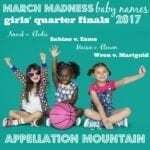 Let’s see which names continue to advance towards the trophy. Ready, set, vote! Two rarities face off in this round: French-Dutch Anouk against Cornish Elowen. Elegant Sabine faces sweetly vintage Maisie. Botanical Marigold or literary Esme? 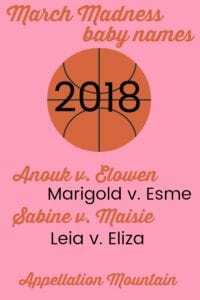 I predict this might be the toughest match of 2018! Is your style more Star Wars or My Fair Lady? Voting will remain open through Thursday, March 15th. 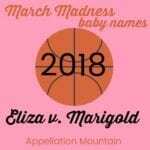 The winners of each match-up advance to the March Madness 2018 baby names SemiFinals on Saturday, March 17th. We’ll keep voting until we announce our winners at the very end of the month! I’m predicting this to come down between Eliza and Elowen.